That’s a big deal for Oz skate, Skateboarding Australia has officially partnered with NIKE SB as their official series sponsor. 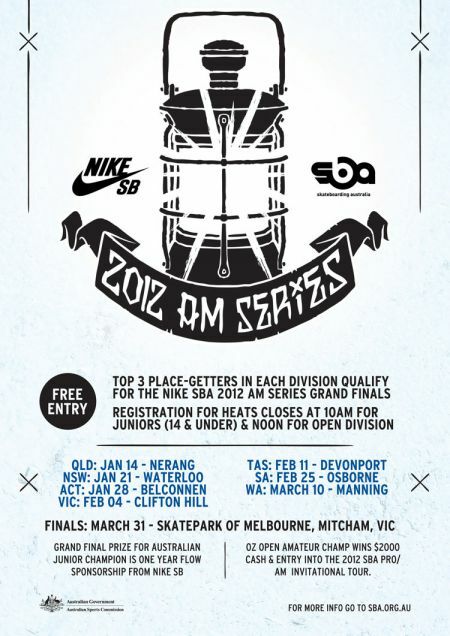 Other news includes some location change-ups, such as SA’s qualifying heat taking place at the new Osborne Skatepark, the Canberra heat taking place at the epic Belconnen park, and our Grand Finals at the end of March happening at the re-vamped Skatepark Of Melbourne in Mitcham, Victoria. All the details are on the flyer. Looks like it’s set to be a pretty impressive series of events. 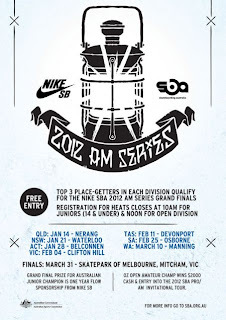 Skateboarding finals for the AM series are in March 2012 at Melbourne.